Atriplex hortensis ‘Rubra’ (red orach): I let this annual self-sow each year, and its magenta-purple seedlings start appearing soon after the ground thaws in late winter or late spring. 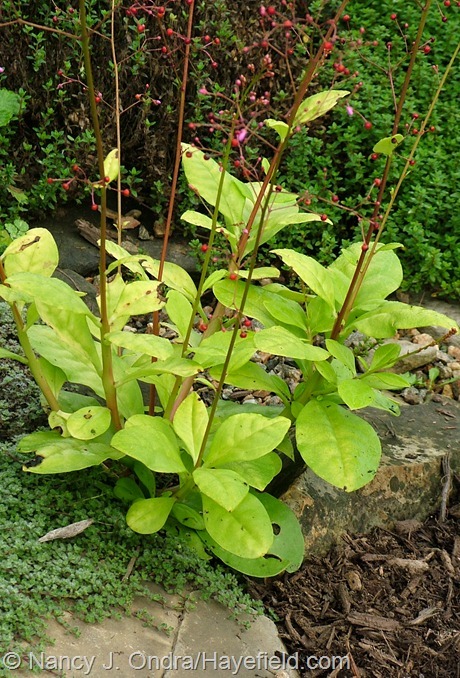 The main stems shoot up to 3 to 5 feet in summer, and the leaves darken to very deep purple. 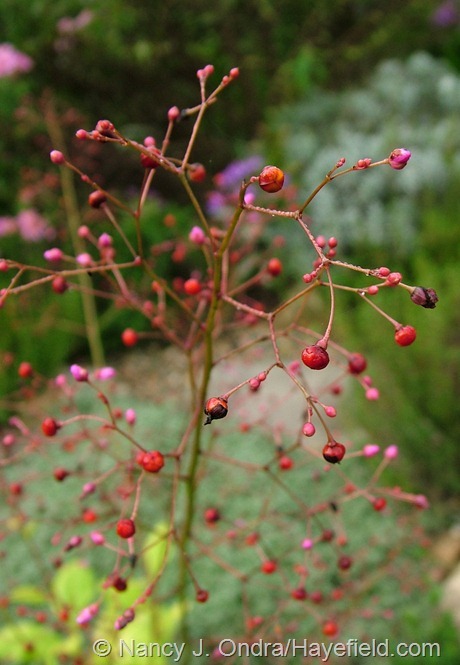 In late summer, the stems are topped with interesting seed clusters. 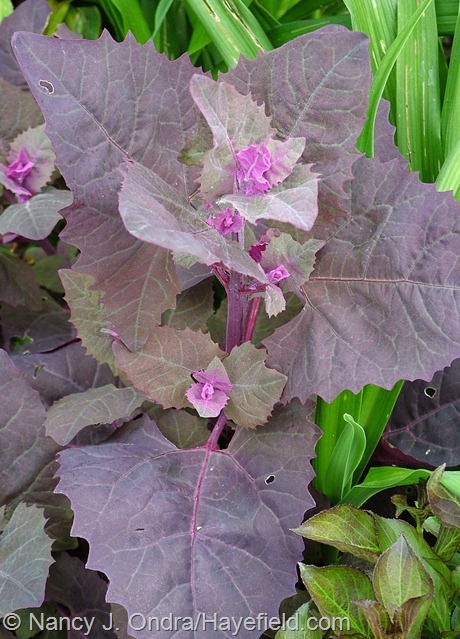 Red orach is supposed to be a tasty edible when young, but I’d much rather save them for their ornamental value. 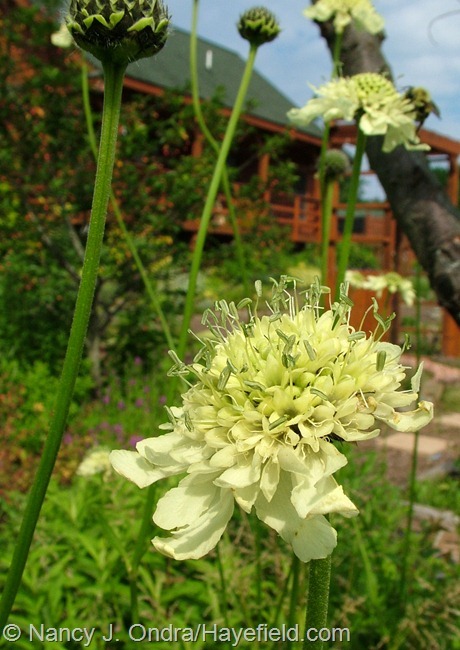 Cephalaria gigantea (giant scabious): Giant scabious isn’t a “wow” perennial color-wise, but it’s pretty dramatic anyway, blooming atop nearly leafless, 6- to 7-foot-tall stems. I’ve seen descriptions that say it blooms all summer, but here it flowers only through June. 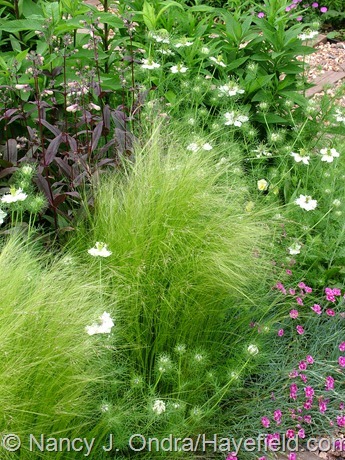 For that reason, it’s not a plant I’d recommend if you have limited space, but if you can put it at the back of a larger border or along a meadowy path, it’s cute and quirky. It wants full sun and seems to like moist soil. 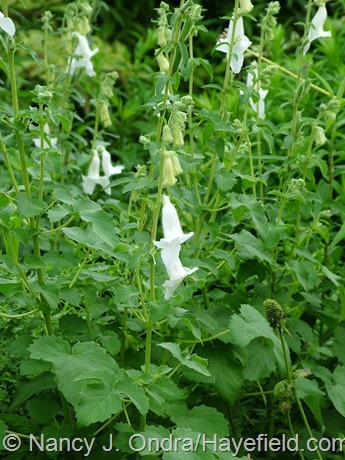 Ceratotheca triloba (South African foxglove): I previously wrote about the white form of the elegant annual (‘Alba’, shown below) in Three Neat Plants – Mid-August. I have seeds of the purplish pink species (shown above) as well. Clematis sp. (leather flower): I started this one from seed ages ago and lost the label at some point. In the last year or so, I’ve become pretty convinced that it’s Clematis glaucophylla, but I can’t swear to it. Whatever it is, it’s a winner. The small pink flowers are charming, and they appear from early summer well into fall, along with a great display of swirly seedheads. 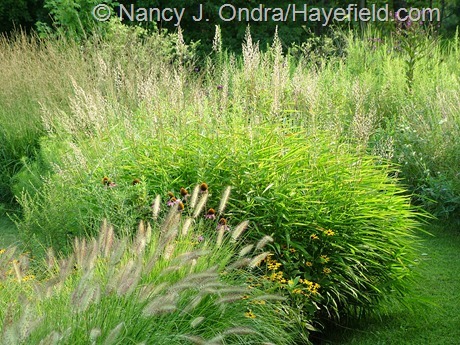 I cut it completely to the ground each year and it nicely fills a 6- to 8-foot tall tuteur. 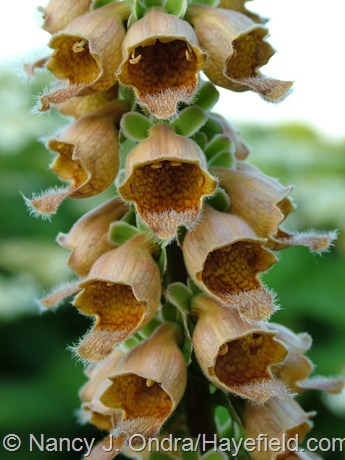 Digitalis ferruginea (rusty foxglove): While I don’t have much luck with ordinary foxgloves, this one has been a winner for me. It’s dependably perennial here and even self-sows, so I now have a nice patch of it. 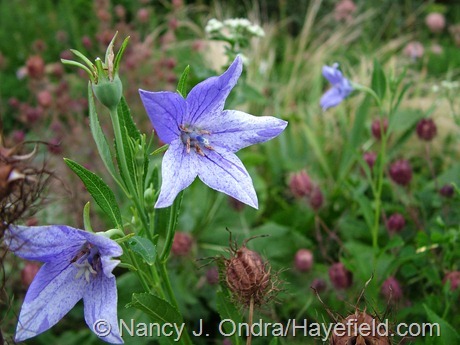 The individual flowers are exquisite close up, and the slender, 3- to 4-foot-tall spikes make a great contrast to mounded companions, such as bluestars (Amsonia). Eucomis comosa from ‘Oakhurst’ (pineapple lily): Pineapple lily produces long, strappy leaves and plump spikes of starry flowers in summer. 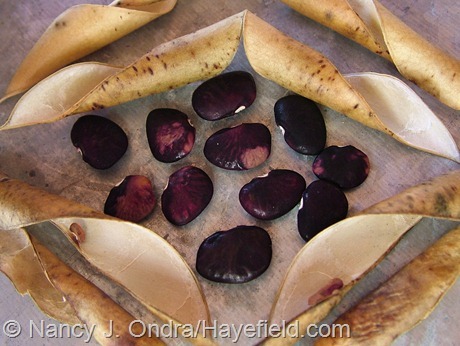 I collected these seeds from ‘Oakhurst’, which has deep purple new leaves that eventually turn purplish green. You can read more about it here: Three Neat Plants. The seed of this bulb produces about 2/3 purple-leaved seedlings and 1/3 green ones. They’ll take several years to reach flowering size. Limited quantities. 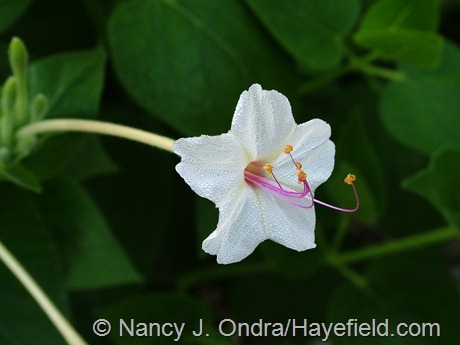 Mirabilis longiflora (wild four o’clock): This annual or tender perennial isn’t much to look at during the main part of the day, but the long-tubed, white flowers are a pretty sight when they open in late afternoon, and they last into the next morning. Best of all, they have a wonderful fragrance too. Try wild four o’clock around a deck or bench where you like to sit in the evening. 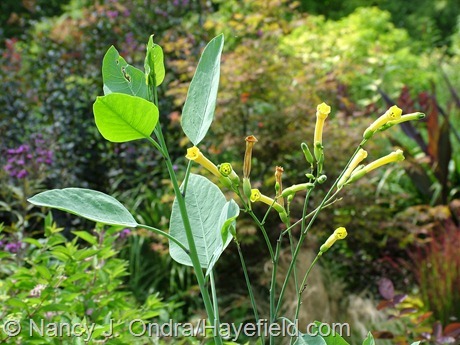 Nicotiana glauca (tree tobacco): Tree tobacco is a very different take on the more common flowering tobaccos. This one does bloom, with relatively small yellow flowers, but its main interest comes from the powder blue foliage. Grown as an annual, its single or lightly-branched stems can easily reach 6 feet tall or more by the end of the growing season. Nicotiana “Ondra’s Green Mix” (flowering tobacco): In my previous garden, I grew N. langsdorffii near N. alata ‘Lime Green’, and this seed strain is the result. 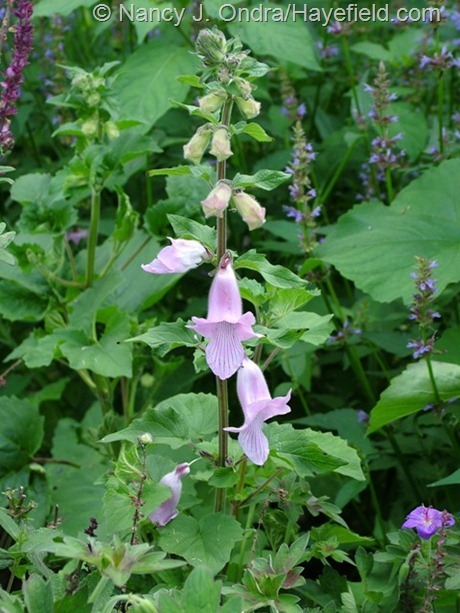 The flowers are generally between the two in size and shape on stems to about 3 feet tall. Nigella damascena ‘Cramers’ Plum’ (love-in-a-mist): This super-easy, self-sowing annual has white flowers that mature into reddish purple seedpods. 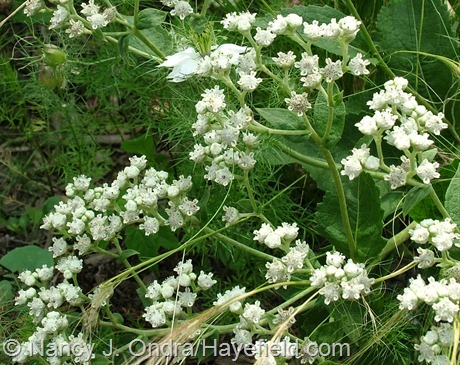 Parthenium integrifolium (wild quinine): I first grew this perennial out in the meadow, and I liked it so much that I brought some of it into the garden. 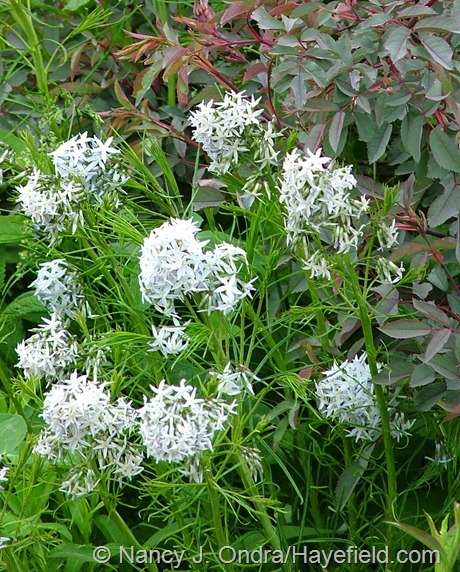 It generally grows 2 to 3 feet tall here, and the white flowers appear from June into September. The foliage can develop some nice fall color as well. Patrinia scabiosifolia (golden lace): One of my all-time favorite perennials, with tall-stemmed umbels of clear yellow flowers from August to October, plus orange-to-red fall foliage color. There’s more info here: Three Neat Plants – Mid-August. Petunia integrifolia (wild petunia): Hybrid petunias usually fizzle out here by the end of June, but this sweet little species just keeps getting better through the season. 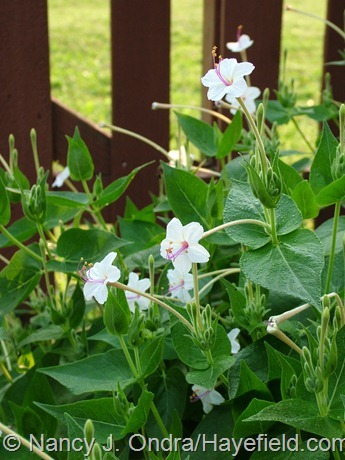 The flowers are small but bright, and the stems have a wonderful way of winding up through other plants. Once you get it going, it often self-sows and puts itself in places you’d have never thought to try it. Phaseolus lunatus ‘Alma’s PA Dutch Purple Burgundy’ (‘Alma’s PA Dutch Purple Burgundy’ lima bean): A new one for me this year, from Amishland Seeds. This climbing lima isn’t something you’d grow as an ornamental, because the flowers are small and barely visible. But if you’re seriously interested in growing and sharing rare heirloom vegetables, perhaps you’d like to give it a try. It wasn’t especially productive for me, but then I’ve never had much luck growing any lima beans, so I have only a very small quantity of these. 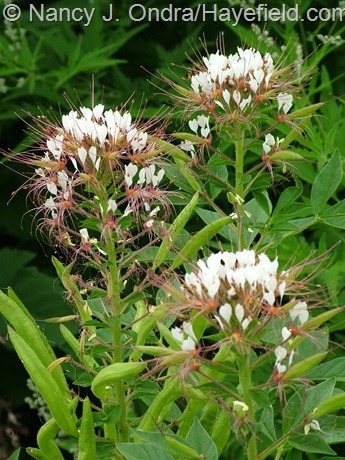 Polanisia dodecandra (red clammyweed): I wrote about this dwarf cleome look-alike in Three Neat Plants. It’s a cute little self-sowing annual. Rudbeckia maxima (giant coneflower): The long-coned flowers of this perennial are hard to miss, because they’re big, bright, and right at eye level. Unlike other rudbeckias, this one has exceptional foliage too: broad blue leaves that look great all through the growing season. 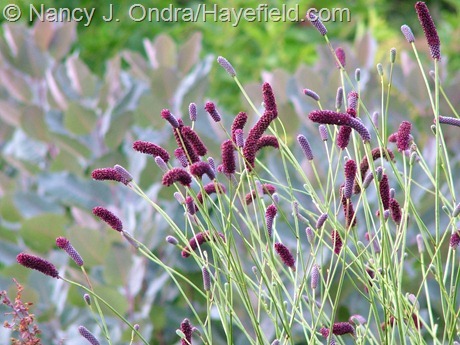 Sanguisorba tenuifolia ‘Purpurea’ (Japanese burnet): Another of my top favorite perennials, with catkin-like reddish purple flowers topping the 5- to 6-foot-tall stems starting in late summer. 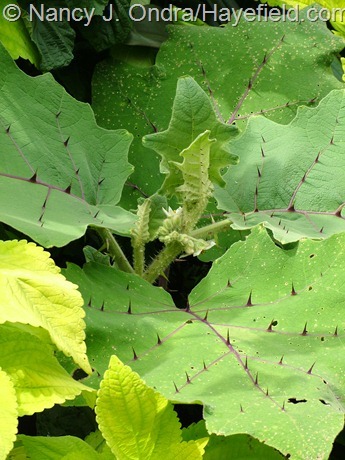 Solanum quitoense (bed-of-nails): I’ve written about bed-of-nails in detail in Three Neat Plants. Though my plants have never produced ripe seed before the first frost, I have a good supply of seeds to share with any of you brave enough to try this spiny traffic-stopper thanks to reader Rick Rickman. 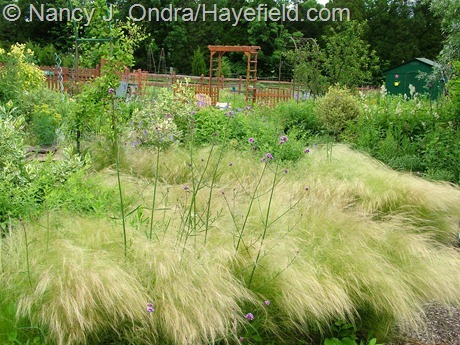 Spodiopogon sibiricus (frost grass, graybeard): Frost grass may not be one of the most dramatic grasses, but this clump-forming perennial has been sturdy, dependable, and trouble-free for me. 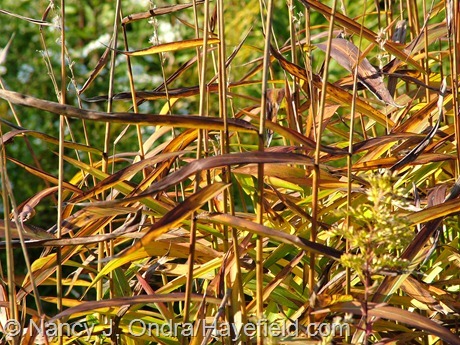 The horizontal leaves give it a distinctive look, and the silvery seedheads look fantastic when backlit. It likes soil that’s on the moist side. Stipa tenuissima (Mexican feather grass, pony tail grass): Which superlatives haven’t I used before to describe Mexican feather grass? It’s lovely all year long, except for the week or two after I cut it down in early spring. I used to grow it as an annual, but it’s finally decided to be hardy here; either way, I wouldn’t want to be without it. Talinum paniculatum ‘Kingwood Gold’ (jewels-of-Opar): Not ‘Kingswood Gold’, as so many sites refer to it; it’s originally from Kingwood Center in Ohio. This easy annual has succulent chartreuse foliage, plus tiny pink flowers that mature into equally tiny, orangey seed capsules; usually about 1 foot tall. Vernonia lettermannii (narrow-leaved ironweed): A few years ago, I started out with the selection ‘Iron Butterfly’, which in leaf is practically a dead ringer for Arkansas bluestar (Amsonia hubrichtii). The foliage of its seedlings isn’t quite that needlelike, but it’s still slender and fine-textured. The 2-foot-tall and -wide mounds are practically smothered in the fuzzy purple flowers typical of ironweeds in late summer and early fall. Spring-sown seeds usually bloom the first year. 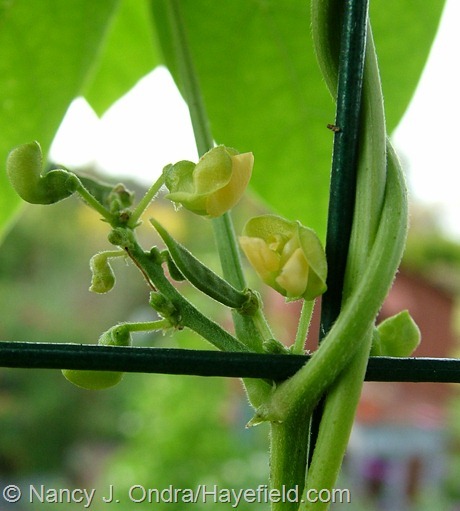 Vigna unguiculata ‘Pretzel Bean’ (pretzel bean): Another one that’s new for me this year. 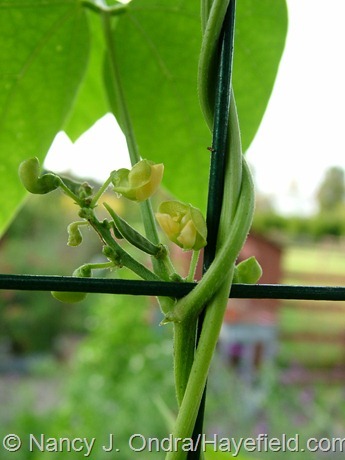 I plan to write about pretzel bean in detail in an upcoming post, but for now, I can recommend this climbing cowpea as a fun ornamental as well as an interesting and productive vegetable. 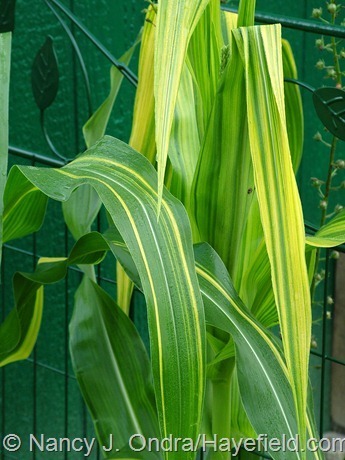 Zea mays ‘Old Gold’ (‘Old Gold’ corn): This stunning field corn grows 6 to 7 feet tall with long, green leaves that are striped with varying amounts of bright yellow. Zinnia tenuifolia ‘Red Spider’ (‘Red Spider’ zinnia): The small, single flowers of ‘Red Spider’ are much daintier than those of common zinnias, and the plants are much more open, to the point of being somewhat sprawling by midsummer. I like them mixed into the middle of a border so they can lean on and scramble up through taller companions. Did you find anything you’d like to try? Put together your wish list and leave it in a comment below or email it to me at nan at hayefield dot com. Feel free to ask for as many different kinds as you want, listed in order of preference (with those you want most at the top of the list). If there are many requests for certain seeds, I’ll fill them in the order I received the requests. I can’t promise that I’ll be able to send you everything you want, but I will do my best to send you something. 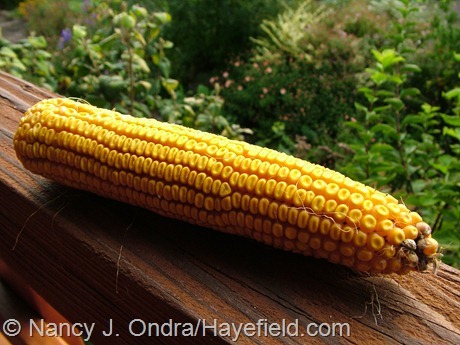 The absolute deadline for seed requests is November 30, 2012. I will not be able to fill any late requests. I thank you again for being loyal readers, and I look forward to sharing a bit of Hayefield with many of you! Oh Nan you are incredibly generous! I would love to put an order in for 1. Cramer’s Plum love-in-a-mist, 2. giant coneflower, 3. Clematis, 4. red Orach, 5. Zinnia red spider. Is there anything you would like my dear? You get first pick, Kerry. I won’t ask for anything in return, but if you have something you love that you think I need to try, I won’t say no! Hi Nan, I was so excited to see that you are sharing your seeds. Wish List: Atriplex red orach, Patrina scabiosifolia gold lace, Zinnia red spider, Ondra’s Green Mix, Japanese Burnet, Talinum panicultum Kings gold. this is so cool! Have a nice Thanksgiving! I LOVE your blog!!!! I’ve added you to the list, Cathy. Look for seeds in December! Nan, I would love some of the Nicotiana ‘Ondra Green mix’ and the clematis. What a generous offer. Great idea too. Do you grow Angelica keskii? Not sure if it would be hardy for you but I love the foliage. I can send you a picture if you are interested. Thanks. Hi Erica! I love angelicas but have never tried that one; it sounds great. I’ll be in touch for your address when I’m ready to send the seeds. Thanks so much, John. Look for seeds soon! Wow! The photos are all very beautiful! You have a great blog. I would love the seeds for “Platycodon grandiflorus ‘Axminster Streaked’ (balloon flower)” or “Zea mays ‘Old Gold’ (‘Old Gold’ corn)”. Of course, if you have an abundance of any other seeds you would like to send along, I would appreciate those also. I would be happy to send you some 4 O’clock seeds, if you are interested. Hi Becky. I’ll put you down for those two and see if anything else is left! Can I just say…You are an inspiration to all. I loved reading about how you designed your gardens and watching the transition from nothing to amazing. I would love any assortment of your plants. I have just moved into a home with an acre and I basically have a blank slate. I’m a bit overwhelmed but very excited about all the potential and fun I will have designing and planting. Having said that, I would love any assortment of seeds that would do well in Utah. Thank you for sharing! How sweet, Charlotte! It sounds like some annuals may be in order for you; I’ll see what I can do. I’ll make sure you get some of the ‘Cramers’ Plum’, Barb; you’ll love it! What a generous offer. Thank you so much! I have been enjoying your blog and your beautiful photography. Would you like to try some verbascum olympicum seeds? Sure, Lorraine – thanks for the offer! I got your address too. No need for payment. I’m happy to share, Inanna, and I’ll send what I can in a few weeks. I love your blog and love your generosity. Thank you so much. 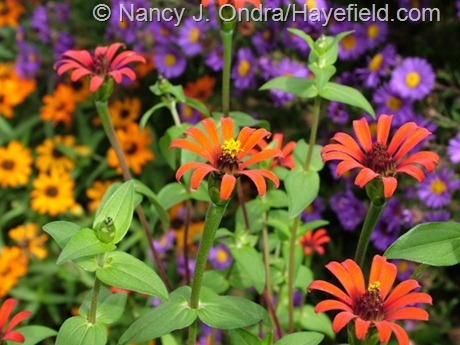 I would love some of your Rudbeckia maxima and if you have extra, Zinnia tenufolia. 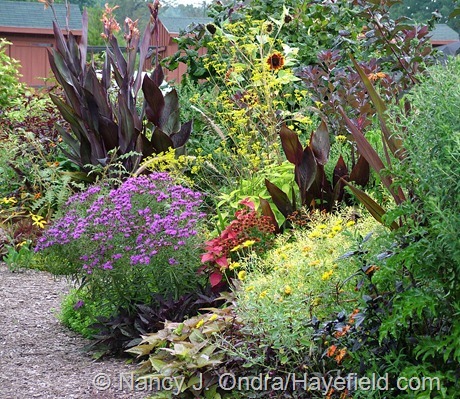 I have learned a lot from your blog , so thanks again for taking the time to write such a wonderful garden blog! You’re on my list, Kathy! I’ll be in touch for your address. Happy 5th anniversary! I started reading your blog about two years ago and always look forward to new posts. Your photos are gorgeous and an inspiration! I would love to try some Sanguisorba tenuifolia ‘Purpurea’, Spodiopogon sibiricus, Digitalis ferruginea, and Amsonia hubrichtii. Thank *you* for reading, Michele! You’re on the list. Nan, I am a brand new subscriber and am so inspired by your pictures! Your kind offer is irresistible. 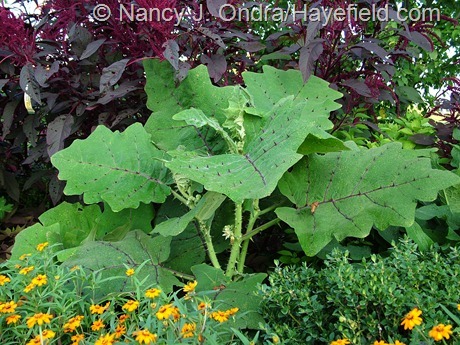 I would most love to try the Japanese burnet, the rusty digitalis, and the variegated pokeweed (I KNOW pokeweed will grow here… Kansas) thanks so much! A double welcome to you, Amy. Good for you to give the pokeweed a try! Look for seeds in a few weeks. How wonderfully generous you are! Your blog and your photographs are huge inspirations for me, and I also love your books. If you have enough, I would love some of the following: Amsonia, Japanese burnet, Rusty foxglove, and the Mexican feather grass. Thank you so very much, and have a happy Thanksgiving! It’s so nice to hear that you enjoy both the blog and the books. I’ve added your requests to my list. Happy Thanksgiving to you too, Anna! 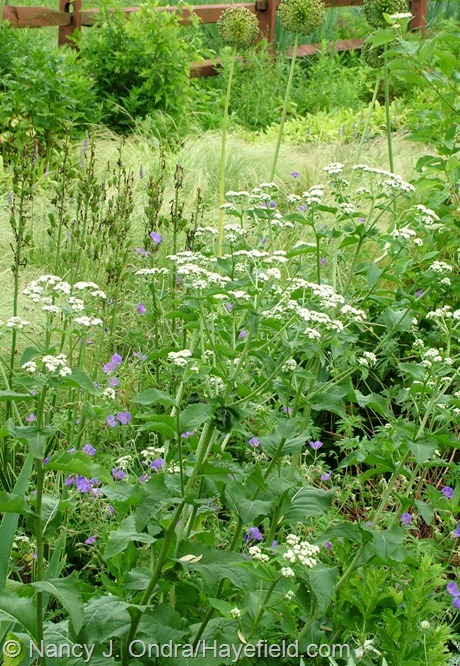 «greedily rubbing hands» Please count me in for Atriplex hortensis ‘Rubra’, Cephalaria gigantea, Ceratotheca triloba ‘Alba’, Patrinia scabiosifolia, Mirabilis longiflora, Petunia integrifolia, Spodiopogon sibiricus. Anything you would like, Nan? 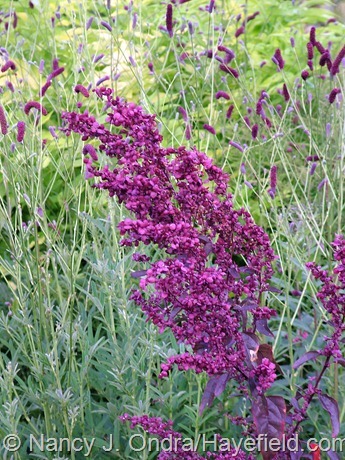 I’ve got some Agastache neomexicana. It smells amaaazing. Also, I’ve got some of the black flowering Penstemon whippelanus that would grow well for you. I just hate to take without giving back for a second year in a row. Sure thing, Susan – I will send what I can. I’m game to try any of your own favorites! but I will keep watching as your garden is a great inspiration! I am *so* sorry to tease you with the seed offer, Burnlee. Maybe you can start a swap with other gardeners in your own area? Thank you for reading and commenting, anyway. 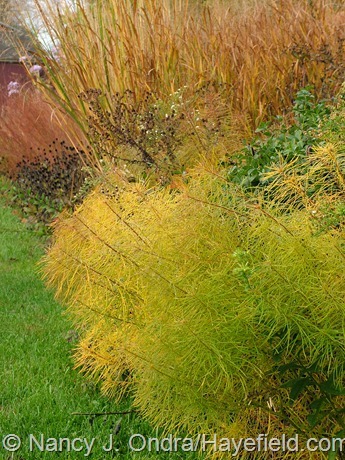 Love this blog…it often keeps me up late at night ogling your gorgeous photos of plant combinations. I love and use your books often in my garden “practice”. Would dearly love some of your Rudbeckia maxima, Sanguisorba tenuifolia, Patrinia scabiosifolia and if available clematis spcs. and any foxglove. Hard not to want them ALL. But clearly you already did and I for one am glad! I surely did want them all and am glad to have them – and even happier to have enough of them to share. I’d also like to use this opportunity to mention how much I enjoy your blog and the books. You are truly an inspiration. Thank you for reading, Rasa. It’s hard to get the Vernonia lettermannii seed even here, but if I find a source for you I’ll be in touch. Glad to see you offer once again seeds from your beautiful garden. Thank you so much to share with us ! My seed list is not yet ready but I’ll send it to you as soon as I can. Good to hear from you, Nicole. I got your address and have your requests on my list. 1 I really like Mirabilis jalapa and have been on the hunt for M. longiflora too. Great, that you’re offering it. 2 Just recently heard about this one and would like to grow it as an edible. 3 Could offer some much needed privacy, seeing there are no hedges allowed at the allottment. And I just love Rudbeckia! 4 Who could resist such a beautiful perennial? 5 Obvious: Edible and beautiful. Match! 6 I’m intrigued and it will help to fulfill the 25% edible rate at the allottment. I would love to contibute to the postage. If there’s any way, please let me know. I will send you an email with my adress, if you don’t have it around from last year. How fun to read your reasons for your choices, Britta. No need to worry about the postage. I think I do still have your address, but if not, I’ll be in touch. Nan, reading your posts is like thumbing through a beautiful catalog of unique garden plants. So much inspiration here. If I had room I would want everything I see. Thanks, Lisa! If you decide that you might be able to squeeze in any of these, feel free to ask. It’s so nice of you to do this again. My pleasure, Mel. I’ll share what I can! From the seed you sent me last year…I grew the black cotton. Such a pretty plant. Red rice…it got crowded out. Loved the ‘red spider’ zinnia. Such a cutie. Grew some amaranth too. I love all amaranths. It’s great to hear about all the successes, Mel! I didn’t seed from either the rice or the cotton this year, though I would have thought it was hot enough. 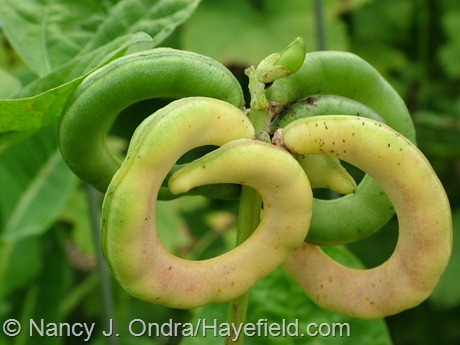 I was reading about the ‘pretzel’ bean. They sound yummy. If you have enough seed I would really love to grow them next year. Do you eat them or just grow them as an ornamental? I should be able to include some of those, Mel. I started with only five seeds and wanted to collect as many as possible this year, so I didn’t harvest any for cooking. I and a few other people nibbled on the young pods fresh, though, and we thought they were good. I don’t have the room for any of your wonderful plants, as I have only a small postage stamp city garden. But I can’t get enough of your beautiful photos, and your descriptions that go with them. I hope you never run out of those! I definitely have an abundance of photos in my archives, Vicki, and I look forward to sharing lots more of them to get through the dull winter months. 3)Variegated Pokeweed-glad to see someone else appreciates pokeweed! Thank you for your generosity. You were kind enough to send black cotton seeds to me last year, got them to sprout planted them out, but they disappeared, I’m guessing slugs or rabbits! Hi Sandi! You’re on my list. I’m so sorry that the cotton didn’t work out for you. I gave away almost all of my seeds last year, and the few I kept for myself didn’t have time to produce more seeds before frost, so I’m totally out of that one this year. My pleasure, Sue. The South African foxglove should do all right for you if you start the seeds indoors early (March-ish), but make sure you give it as much sun as you can. Oh dear I would so love to have a plant from your garden growing in mine. I too am short on space but I love the Japanese Burnet, ‘Purpurea’. You’re very welcome, Theresa; I should be able to send you some of the burnet. Thank you so much. It occurred to me the postage will be more for Canada. I will purchase the correct stamps and send to you with addressed envelope. Can you email your address? Don’t worry about that, Teresa. It’s kind of you to offer, but I don’t mind covering the postage. I’ve added your requests to my list, Loren – thanks! I enjoy seeing all your wonderful plant combos. You always have something new I would like to add to my garden. Good choices, Barb! I’ll be in touch for your mailing address. I’m so happy I stumbled upon your blog. I dream of having your yard in mine and thank you so much for your generous seed offer! I love pass along plants. If you have any of these seeds remaining I would appreciate them very much. 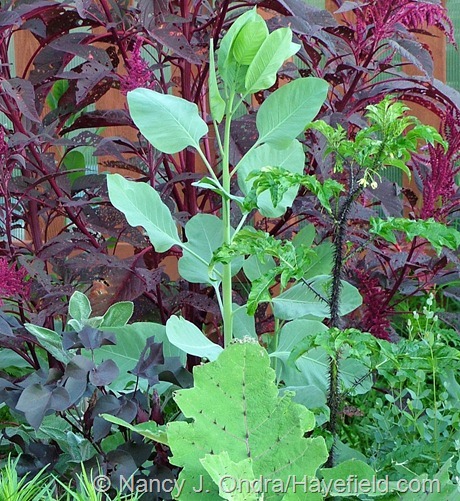 Pineapple Lily, Red Orach, Wild Petunia, Amsonia, Narrow-leaved Ironweed. I too am happy that you found your way here, Laura. Look for seeds in a few weeks! So generous Nan! Everything you post is eagerly anticipated! Seed request list sent by email. Got your list, Alan – thanks! What a fantastic and generous offer! Do you ever accept visitors to your gardens? 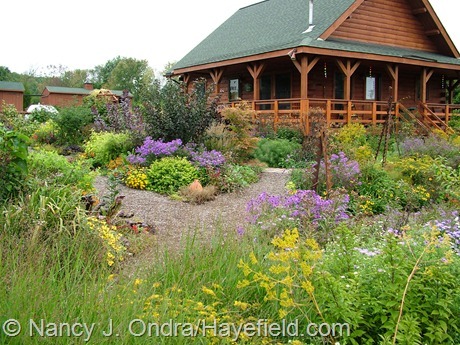 I live in NW Wisconsin and enjoy my perennial gardens for photography also. I pair a photo with a quote each day on tumblr and enjoy making cards with my photos. I would love to exchange some cards for the seeds. 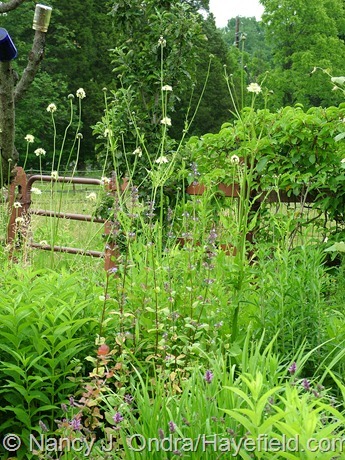 My wish list is: Red Spider Zinnia, Japanese Burnet, Giant Coneflower, Red Clammyweed and Leather Flower. Thanks for your work in offering such a beautiful, inspirational and educational blog! Thanks for reading, and for you requests, Julie. I generally don’t have garden tours anymore; it’s just an overwhelming amount of work to get the garden ready for visitors. As you know, you can hide a lot with creative photography! Happy 5 years! Photographs are breath-taking. I wish I had more room also. 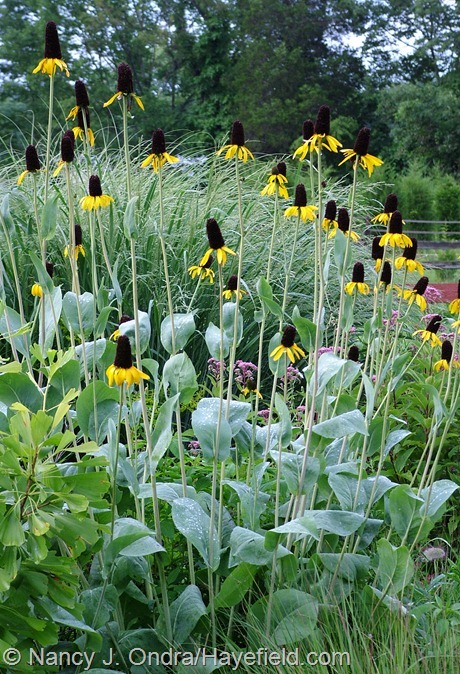 If you could only have one very tall coneflower, would you pick Maxima or Sweet-Henry Eilers? I only have room for one. Ow…you’d make me choose one? I guess it depends on where you plan to put it. They’re both about the same height, but ‘Henry Eilers’is a bulkier plant (mine’s about 1 foot across at the base and 18 to 24 inches at the top), while maxima is dense at the base in spring (maybe 18 inches across) but very open once it shoots upward. I like ‘Henry’ for the middle to back of a border but maxima for closer to the front or along a path, so the foliage is visible. Thank you – very helpful indeed! Excellent, Greg. Really, you’ll enjoy either rudbeckia. you are so generous! i am having to start over, and i would so appreciate seeds from any thing. the balloon flower, foxglove nigelia, pineapple lily, pokeweed,pretzel bean or just continue you posts, i’ve been gardening through your blog this year hoping to start over . Continuing the posts is a given, so I’ll send along some seeds too, Sherry, as well as wishes for a great start on the new garden. Thank you for your wonderful blog! You are an inspiration to us all! Happy Thanksgiving! Thanks so much, Shenandoah, and Happy Thanksgiving to you too! Hi Nan, You have the best garden blog out there! I love the beautiful pictures and have learned so much from it about plants that I never heard of before. Thanks for the generous offer of seeds. If you have enough I would like Golden Lace, Wild Quinine and Love-in-a-Mist. That’s great to hear, Karen. Look for some seeds in the mail in a few weeks! Nan, I look forward to reading your blog and the beautiful pictures. I have tried to grow pineapple lily several times at about $20 a shot. It’s not hardy in my zone but I thought I could over-winter it in our sun room. It didn’t work. I am able to grow the Mexican wind grass though. It reseeds and sometimes I bring a clump inside. I love it. 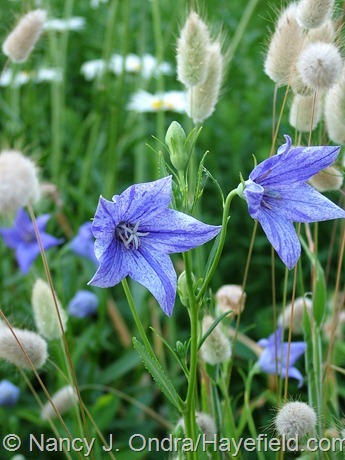 I love the combination you have with the nigella damascene and the Mexican grass. I’m not sure what the other pinkish flowers are but I would like to request seeds from the nigella and those other flowers that are shown in that photo. 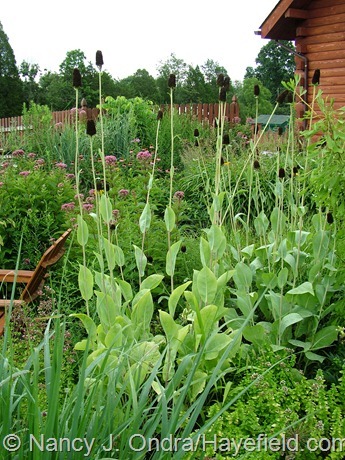 I would also like some seeds from the giant cone flower and beautiful Japanese Burnet. Thank you very much Nan. Hi Cheryl. The pink flowers in that combination are from Penstemon ‘Dark Towers’; unfortunately, I’ve already cleaned up the garden, so I don’t have any seeds of that to share. Maybe you can find some plants locally. I’ll definitely add your other requests to my list, though! AHHHH!!!! How I’ve been waiting for this!!! I do have to report, from your past year’s gracious seed gift the Eucomis Comosa ‘oakhurst’ and the Gossypium herbaceum ‘Nigra’ were a bust… mostly on my part, hahaha! But the Varigated Pokeweed and the Amsonia hubrichtii (Arkansas bluestar) are quietly overwintering in a protected veggie bed… awaiting their final resting places in the border’s. 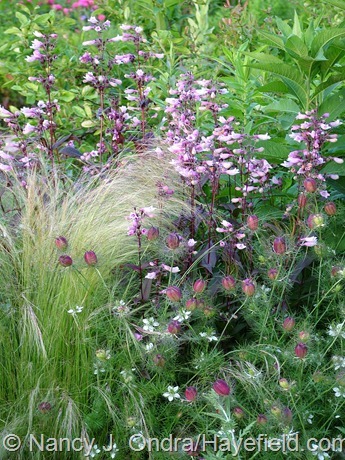 I was tempted, but I will pass on the grasses for the time being! I have some N. Sea Oats and Little Bluestem that I need to properly grow first, then I’ll attempt some new ones… hehehehe! Come on, Donna – show a little enthusiasm, why don’t you? I’ll happily set aside some of these for you; don’t worry about sending an envelope. Oops – I don’t seem to be having luck e-mailing you, and I don’t have your address. Could you e-mail it to me, or leave it in a comment here (I will not let it be visible to all). Nan, what an incredible offer! I’ve already been planning to steal some of your combinations–your blog has been so inspiring. I’d love Amsonia, Nicotiana, and Rudbeckia, if I’m not too late. Steal away, Heather – I’m honored! I’ll be glad to send along what I can to help the cause. What a wonderful treat! 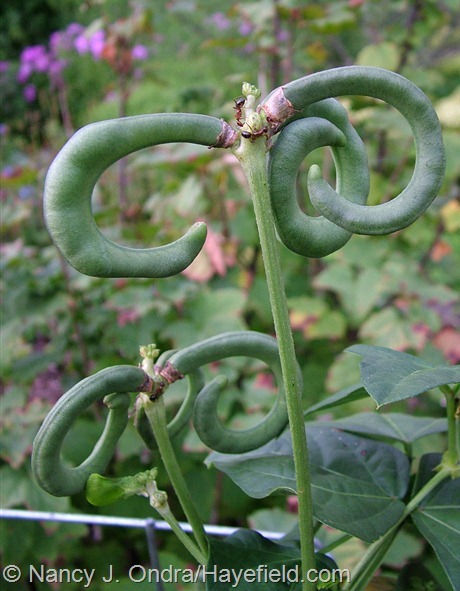 I really enjoy going through your blog posts for pics of plants to try, so your kind offer is hugely appreciated. I’d love to have some seeds of Rudbeckia maxima and the Clematis if you haven’t run out yet. You’re on my list, Ann! I love your blog so…I learn so much, now if I could just apply it here in IL more successfully. Thank you for sharing. I’d love some Japanese burnet, pineapple lily, arkansas bluestar, red spider zinnia, giant coneflower, cramer’s plum, and red orach. Thank you for whatever you can send! Thank you, Ginnie. Maybe you need to check out some blogs closer to your area as well? But you should be able to have luck with at least some of these seeds. I’ll be in touch for your mailing address and send along what I can! 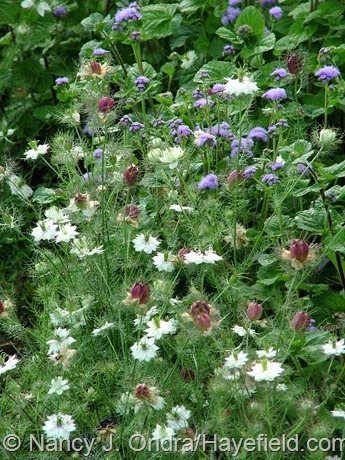 I would love some seeds for the ‘Cramer’s Plum’ love-in-a-mist. I saw them in picture you posted awhile back and have been looking for a source ever since. 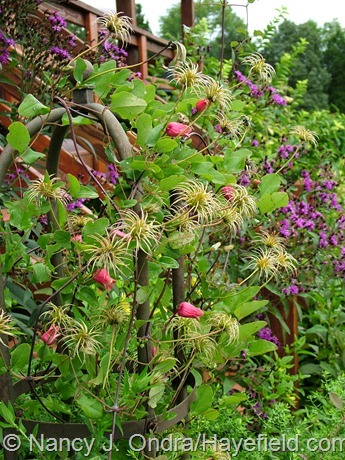 The clematis looks gorgeous, though I’ve never had luck with growing clematis from seed so far. The Japanese Burnet also looks amazing. Though most things do, on this blog. Thanks for your amazing generosity! That nigella really deserves to be more widely available, so I’m delighted to share the seeds as widely as possible. Watch for an envelope soon, Aaron! How kind you are to provide this seed at personal expense. I always go to your blog to view it when you post pics and info from your garden. I must say it is becoming an American treasure. Since I live near the tallgrass praire in Kansas I would like some Rudebeckia maxima first of all and Vernonia lettermannii as they are similar to our natives. 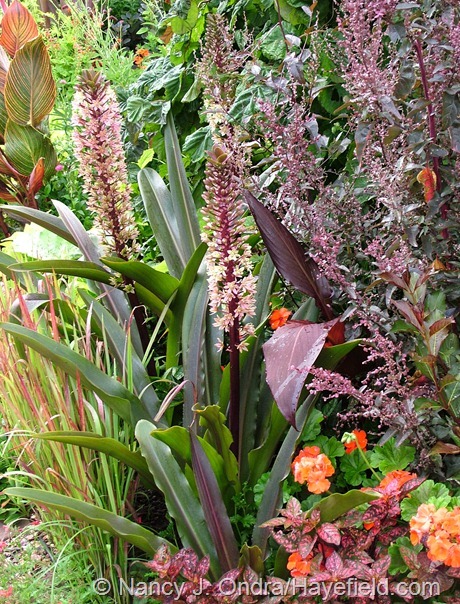 Would also like Eucomis comosa for my ornamental bed along with Digitalis ferruginea and Patrina scabiosifolia. Cool! I will leave another comment next with my address. Thanks! Great choices, Greg. I got your address too – thank you! I enjoy your blog and look forward to your posts showing up on my reading list. If you have seeds of the feather grass and the clematis left I would love to try them. I just added you the list (well, now it’s a chart)! I’ll be in touch for your mailing address, Sue Ellen. Nan, I am so thankful came across your blog. I have been enjoying your posts and gardens for about 2 wks. Now comes this wonderful offer to share seeds… what an opportunity… If I am not too late could I please have some seed for the Clematis sp. 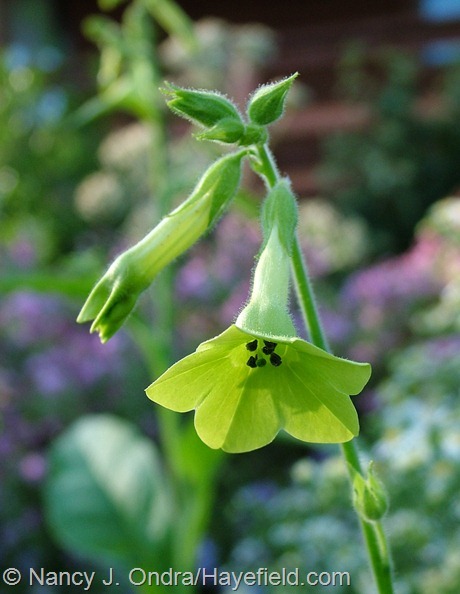 , Ceratotheca triloba ‘Alba’, or the Nicotiana “Ondra’s Green Mix”. Thank you so much for your wonderful blog as well as this generous offer. Welcome, Jeanne! I’ve noted your requests, and I’ll be in touch for your address. Well, we’ve all been waiting with baited breath(whatever that is!) for the seed offering! How generous of you and how fun it is to be able to have some of your lovely garden in my own little patch of earth. Thank you so much in advance! And by the way my purple plantains are developing nicely despite several trimmings from the rabbits. They look pretty cool next to nepeta ‘Walker’s Low’. Great to hear that the purple plantain worked out, Kate! I hope that you’ll have equally good luck with these. They’ll be on their way in a few weeks. Nan this is great what you’re doing! 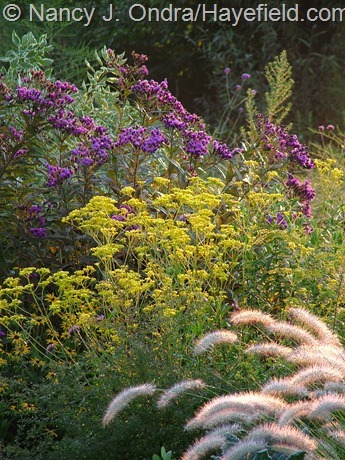 The ironweed and golden lace I mentioned in my e-mails are top of my list but if you have enough i’d love to try Atriplex hortensis and Sanguisorba tenuifolia ‘Purpurea’ as well. Do you ever work with agastaches ? They’re almost all full sun and carefree. I couldn’t recommend them more, especially the ones with interesting foliage aromas and colours. Thanks for letting me know, Jesse; I will add those to your requests. 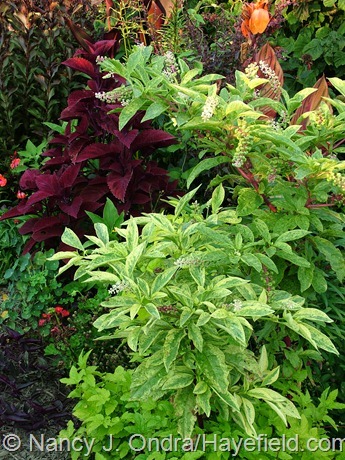 I really enjoy agastaches: the purple/blue ones are usually the only hardy kinds for me, but can grow other kinds as annuals. Nan – feeling a bit guilty about your generous offer since I only recently started subscribing. You are such a time-saver. What goes good with what? Easy – search on ondra and the plant in question. I love to grow from seed. This summer’s triumph was goji berry vine from seeds found in a pack of Chinese tea! So, about the only thing I don’t need is Talinum of which I have plenty of seeds and still some plants in very sheltered areas. 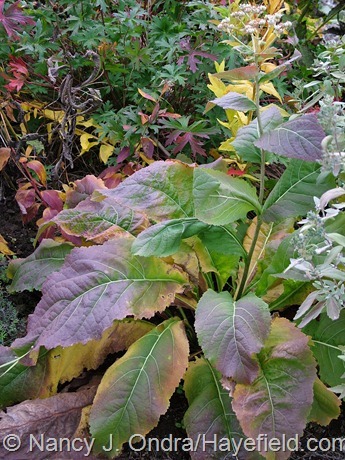 Variegated pokeweed makes my heart thump with anticipation – perfect for the weed border ( planned 2013.) I’m happy to take whatever you may have left at the end of the day. My current challenge is to get my datisca cannibina to come from seed. I think 3 people in North American know what it is! Nice to meet you, Tiiu. It’s great to have you as a reader. I’ll make sure to set aside some of the pokeweed for you. If you want more Datisca seed to experiement with, I may be able to collect some. It’s self-sowing at this point, and I really don’t need any more of it! Nan, thank you so much for giving again! I’m down far on this list, but if you do end up with any of these: Wild petunia, Narrow-leaved ironweed, Rusty foxglove, the clematis, and the Red orach. I enjoy your blog so much, your plantings are inspired! Thank you, thank you, and a blessed Thanksgiving to you! You’re definitely not too late, Donna. I have your requests in my chart. Happy Thanksgiving to you too! Nan, thank you so much for generous offer. I would love the white foxglove for my all white garden. It’s a new bed and I have lots of room. I’ll make sure you get some of the white Ceratotheca, Judy! Hey Rick. I’m doing my best to share the ‘Old Gold’ as widely as possible – thank you for that beauty! I will make sure you get these seeds. 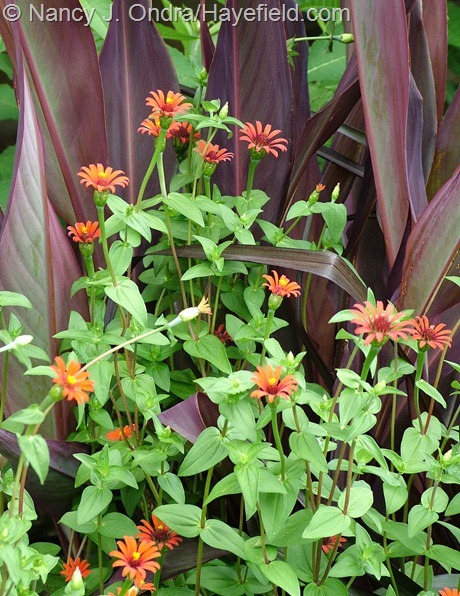 Oooh…a variegated Rudbeckia maxima…what a loss that was. Nan, I have so enjoyed your photos and wonderful plant combinations. 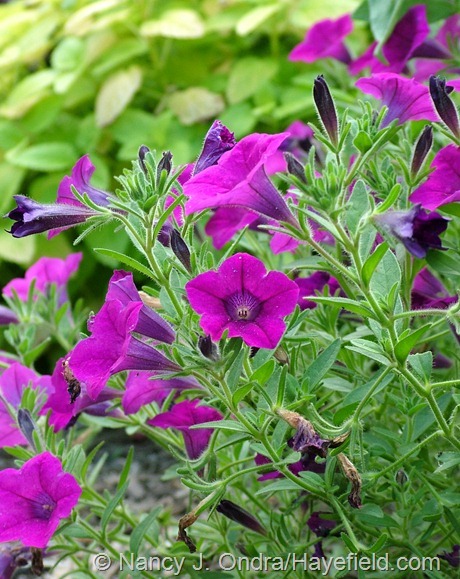 If you still have the clematis, nicotiana,and petunia I would love to try them. Thanks, Janyce! I’ll send along what I can in a few weeks. I appreciate you spreading the word, Humberto. I’ll be in touch for your mailing address so I get those seeds to you. I’d be more than happy to pay for the shipping, Nan. You are so generous. Hi Karen! I’m honored that you actually visited that day, and it’s so nice to hear that you enjoyed seeing the garden. I have your requests on my list! Will there be tours of your garden in 2013?!! I don’t think you are too far from me – I would love to see your gardens in person. Please let me (us) know if that is a possibility in 2013!! No more garden tours for me, Gayle; it’s just an overwhelming amount of work to get the garden in show condition. Plus, though most the people who come are very nice, there are always a few who are not so nice, and that tends to spoil the event. Hence, the blog: I can always show what looks the best; the weather isn’t so much of an issue; I can greet each visitor (or at least each commenter) individually; and if people don’t find the pictures of interest, they rarely leave negative comments. Happy 5th anniversary and congratulations for 5 years of inspiring posts and gorgeous photos to accompany them. I am a member of our local urban farming organization and live in a house opposite a park so we get lots of foot and car traffic. My hubby and I do a curbside planting subtly trying to promote growing your own vegetables so we combine ornamentals with edibles trying to catch public interest. In short, I think we need these plants! Thanks, Nan, for your generosity in all ways. Thanks, Barbara! These two plants will definitely grab lots of attention. Look for the seeds soon! Hi Nancy, thanks for such a nice offer. I loved this entry not just for the usual reasons of fun, interesting, educational, inspiring, and plain old great photography, but also for the enthusiastic replies from all your readers. 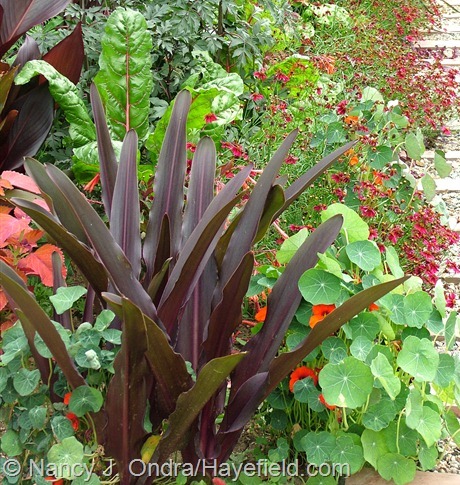 Someone mentioned pokeweed and a “weed border” heh heh, if I had the room I probably would have given that a try! 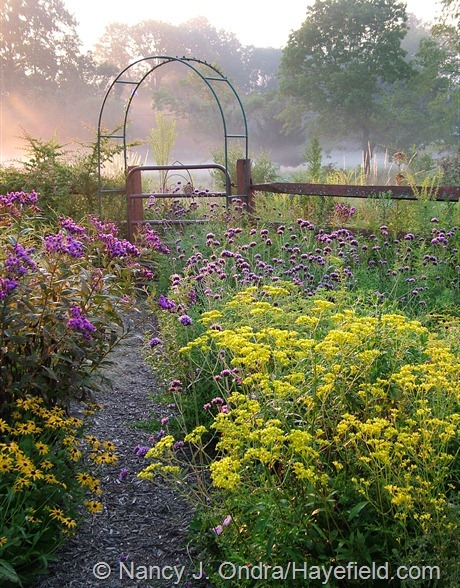 Yes, I too loved the idea of a “weed border.” With all the asters and goldenrods that have seeded into the garden from the meadow, maybe I could say that I already have one! I’m so glad you’re having fun with seed exchanges. I definitely think you could add dahlias to your list of addictions: you need something to keep you going from spring to spring, right? Hi Frank – I have enjoyed dahlias for many years and this year I was vexed by Stink Bugs!! I knew stink bugs were attacking fruit and vegtables but how sad to see them sucking the life out of my dahlia plants!! Not sure where you live – but if you are in stink bug territory – be ready!! I would be happy to send you seed from my husband’s grandmother’s white or pink dictamnus plants. She had them for decades, and gave them to me when she moved to the retirement home. They are gorgeous each spring, and my kids love to light them up on a calm evening, with no harm to the plant. Thanks again! Happy Thanksgiving to you and yours! Good to hear from you again, Carolyn. I’ll send along as many of these as I can! Thank you so much for your generous offer of sharing seeds! How kind! Hi Marion! I just added your requests to the list. Look for seeds soon. Patrinia – I’ve always been envious of these in your photos! 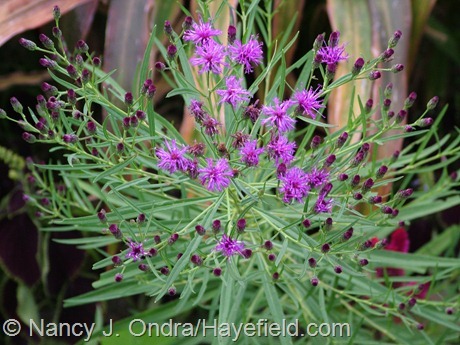 Vernonia – LOVE these…want to try my hand at growing them again! Sanguisorbia – Again, your photos of that always make me drool! Gotcha, Scott – I send what I can! Hi Nan – I so enjoy your blog – your photos are always inspirational!! Thank you for your kind offer of seeds. If any of the following are left I would love some! You’re very welcome, Gayle – I’ll send what I can. I am so excited! I have four little amsonia plants from the seeds you sent last year…they are small, but I am holding out hope that they will make it through our cold and often dry winter. 2. Eucomis comosa ‘Oakhurst’ I am such a sucker for dark foliage!! 4. Stipa tenuissima. My garden needs more grasses!! Thank you so much, Nancy! What a thrill to have new seeds to look forward to starting! That’s great news about the Amsonia, Katie. I think I have your address from last year; I’ll be in touch to confirm it. Love your blog. This is incredibly generous of you! 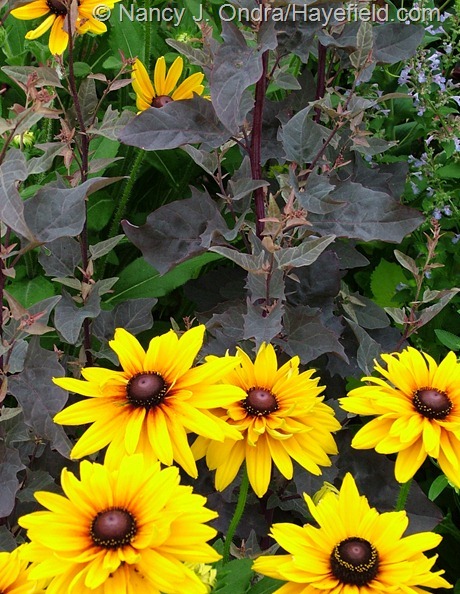 I would love the Rudbeckia maxima, Patrinia, Petunia, and Atriplex, if available. Thank you so much!! You’re welcome. I’ll be in touch! I am a new gardener and have been so inspired by your blog and gorgeous photos.You have an amazing eye for color! My house is a little cabin in the woods and the garden barely gets 5 hours of sun a day, but I’d love to try the Nigella if you have any seeds left. Thank you so much! Can do, Sarah! I’ll be in touch for your mailing address. Oh my, Nan, you are so generous to share seeds from your beautiful gardens! I have enjoyed seeing your pictorial updates all season long. My requests would be: Rusty foxglove, Golden Lace and/or Balloon flower. Thanks so much for sharing. Thanks for the list, Rachel. These should do well from you; you’re not all that far away from where I live! I am enjoying your blog for about a year now and have learned important and interesting things here for which i am very thankfull. I’ve added you to my list and will send as many as I can, Elė. I’ll be in touch by e-mail for your address. Hey there, Amy. Nice to meet another reader in the area. Look for seeds in a few weeks! Thank you once again for being so generous with your bounty! 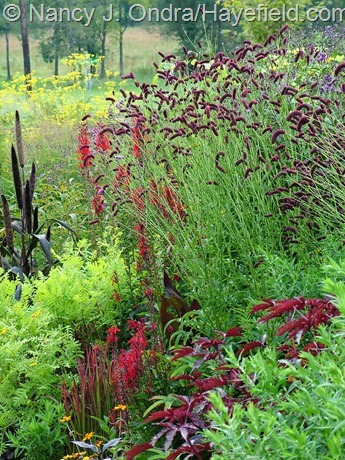 I would love to try the Atriplex, Nigella, Ceratotheca, Rudbeckia and Sanguisorba. Wish me luck! Wow….. as if all the hard work to produce a blog with creative and thoughtful content [not to mention great images w/ great plant ID’s] weren’t gifts enough! If I’m lucky enough to get some, I’ll be planting these seeds in a community park in Northwest Philadelphia called Ned Wolf Park. Hey there, Eric. I’m glad you found some seeds you’d like to try. I’ll be glad to send them along. 1. Talinum paniculatum ‘Kingwood Gold’ (jewels-of-Opar). I’m happy to help with the rebuilding effort, Lyn. I hope all of you never have to endure a drought like that again. Look for seeds soon. 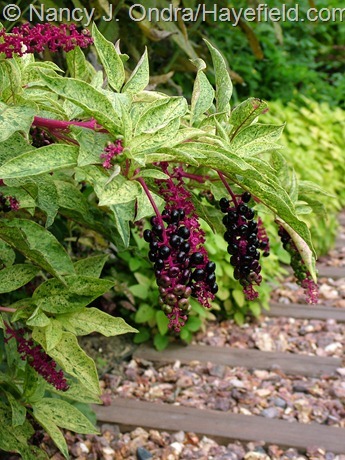 I’d love to try the variegated pokeweed. I’m not sowing many seeds this year, but just want you to know that your Nicotiana ‘Ondra’s Brown Mix’ is chin high and keeping the hummers happy this late into November. The seeds you gave me last year were so much fun to try, and it’s wonderful that you’re doing it again this year. Thanks so much, and happy holidays. Thanks so much for the news on the nicotiana, Denise! I hope you’ll enjoy the pokeweed just as much. Thank you so much for sharing these seeds.I am a huge fan of your books and blog. Based on your recommendation, I have been diligently looking for narrow-leaved ironweed and Japanese burnet, but I was not very lucky to get them here in Michigan. Now you offer the seeds!! I hope they will be easy to start from seed. Thank you for your generosity. Great to meet you, Kris! I will be happy to share as many of these as I can. Hi there, Jesse – thanks for reading. Look for seeds in a week or two! Squeaking in the at the last moment here…. thanks so much all the photos and info, inspiring us all to try some new and interesting plants. and won’t everyone have a great “garden story ” for visitors about the origin of the seed! 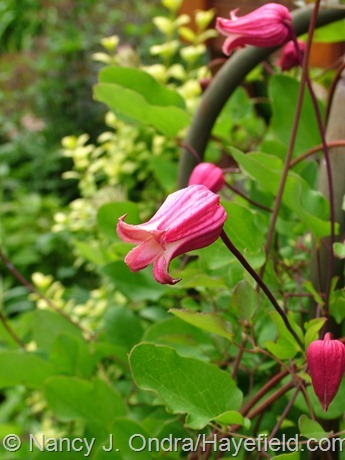 If there are any left I would love to try the clematis glaucophylla..is it hard to start from seed? I grow over 100 clematis and grew only one of them from seed. I’m glad you got your requests in, Cheryl. I have a few of these left and will send along what I can. Please leave me another comment with your mailing address (I’ll make sure it isn’t visible to everyone) or email it to me at nan at hayefield dot com. Thanks! I can see I’m really late to the party here. If you have any seed left for Atriplex hortensis ‘Rubra’ (red orach) and/or Digitalis ferruginea, I would love to receive it. If not, my next choice would be Talinum paniculatum ‘Kingwood Gold’, Platycodon grandiflorus ‘Axminster Streaked’ or Rudbeckia maxim. Thanks so much. Sorry you had trouble posting, Deborah. I’ll send along what I can. Love all your beautiful photography! Just makes me drool! 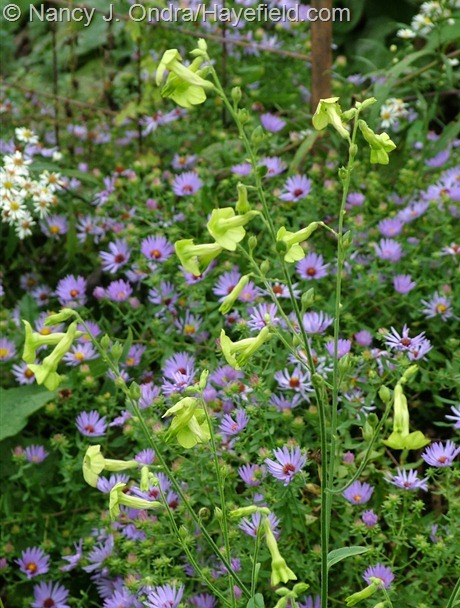 Would love to try Nicotiana “Ondra’s Green Mix”! 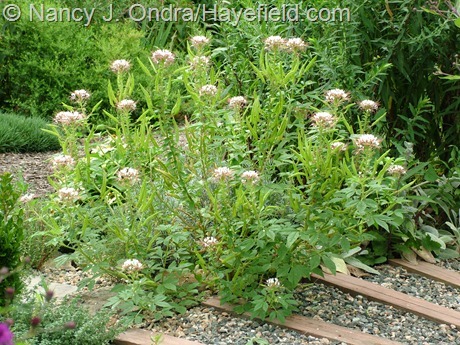 Other options are Polanisia dodecandra and Vernonia lettermannii. Look for some of the Nicotiana soon, Leah! Nan, Thank you so much for your generosity. 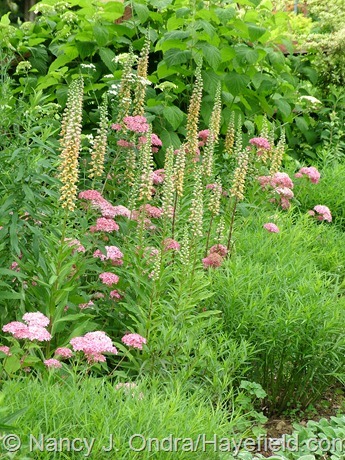 If you have any left, my wish list includes: Atriplex hortensis ‘Rubra’ (red orach), Digitalis ferruginea (rusty foxglove), Sanguisorba tenuifolia ‘Purpurea’ (Japanese burnet), and Vernonia lettermannii (narrow-leaved ironweed). I’ll be sharing them with a few friends and sowing the seeds in my mother’s garden. Hi Julie. I’ll send what I can, but there probably won’t be enough for you to share too. I hope you won’t be disappointed.